Last week, Harvard University (please say that with your nose in the air) held a conference for some pretty smart women of the world — Women Engineer Code. At said WECode event, Goldman Sachs stepped in for the key sponsorship. 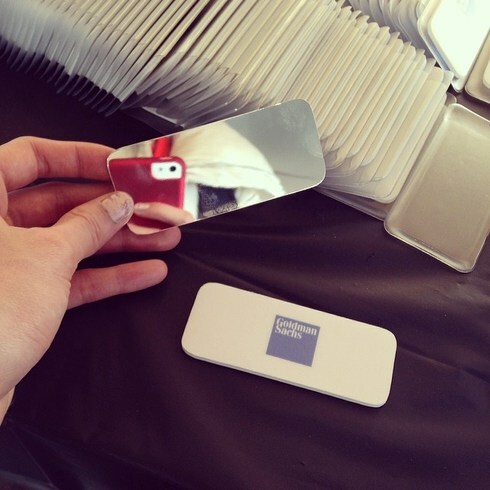 Its savvy idea for swag would be a compact mirror and nail files. Keep it classy, GS. And that was the selection. What misogynistic dinosaur made that decision? “We are strong supporters of efforts to recruit and retain women in technology. We apologize if the gifts gave anyone offense,” a Goldman Sachs spokeswoman said in a statement to the Times. Keep telling yourselves that, GS.